THE SON OF MAN DID NOT COME TO BE SERVED BUT TO SERVE AND TO GIVE HIS LIFE AS A RANSOM FOR MANY. Our readings this Sunday give us three different views of the suffering servant - the one who will give his life as a substitutionary atonement for the sins of the people (our sins.) The image of the blameless lamb that is sacrificed in atonement for sins is as old as the bible itself. 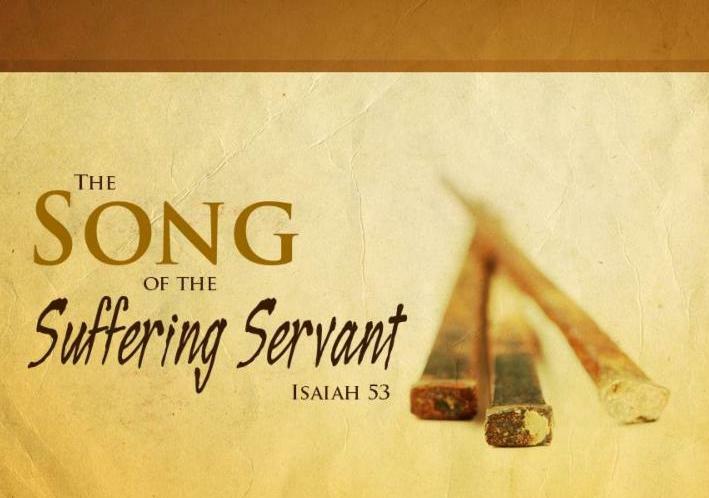 In our first reading (Isaiah 51:10-11), we hear an excerpt from Isaiah's fourth Song of the Suffering Servant. Reading this passage in light of the resurrection of Jesus, it is clear that Jesus is this "servant who shall justify many and their guilt he shall bear. The LORD was pleased to crush him in infirmity. If he gives his life as an offering for sin, he shall see his descendants in a long life, and the will of the LORD shall be accomplished through him. Because of his affliction he shall see the light in fullness of days; through his suffering, my servant shall justify many, and their guilt he shall bear. In our Gospel reading (Mark 10:35-45), we hear the incredible request by James and John to share in Jesus' glory. Even after multiple references by Jesus of his impending passion and death, they just didn't get it. Jesus responded by asking them, "Can you drink the cup that I drink?" "We can", they readily replied. Little did they know that indeed they would. James and John, the sons of Zebedee, came to Jesus and said to him, "Teacher, we want you to do for us whatever we ask of you." He replied, "What do you wish me to do for you?" They answered him, "Grant that in your glory we may sit one at your right and the other at your left." Jesus said to them, "You do not know what you are asking. Can you drink the cup that I drink or be baptized with the baptism with which I am baptized?" They said to him, "We can." Jesus said to them, "The cup that I drink, you will drink, and with the baptism with which I am baptized, you will be baptized; but to sit at my right or at my left is not mine to give but is for those for whom it has been prepared." When the ten heard this, they became indignant at James and John. Jesus summoned them and said to them, "You know that those who are recognized as rulers over the Gentiles lord it over them, and their great ones make their authority over them felt. But it shall not be so among you. Rather, whoever wishes to be great among you will be your servant; whoever wishes to be first among you will be the slave of all. For the Son of Man did not come to be served but to serve and to give his life as a ransom for many." Jesus summoned the twelve and said to them, "You know that those who are recognized as rulers over the Gentiles lord it over them, and their great ones make their authority over them felt. But it shall not be so among you. Rather, whoever wishes to be great among you will be your servant; whoever wishes to be first among you will be the slave of all. For the Son of Man did not come to be served but to serve and to give his life as a ransom for many." In our Epistle reading (Hebrews 4:14-16), the author compares Jesus to the great high priest who offered sacrifice once each year on the Day of Atonement or Yom Kippur. Because our "great high priest" has offered himself as the sacrifice for the sins of the world (Once, for all), we can approach Jesus with the confidence that he understands our suffering as well. Brothers and sisters: Since we have a great high priest who has passed through the heavens, Jesus, the Son of God, let us hold fast to our confession. For we do not have a high priest who is unable to sympathize with our weaknesses, but one who has similarly been tested in every way, yet without sin. So let us confidently approach the throne of grace to receive mercy and to find grace for timely help. Sometimes, like the apostles James and John, we may fail to understand the significance of the passion and death of Jesus for the atonement of our sins. Sometimes, we may act as if we haven't been saved, absent of the profound joy that salvation brings. Perhaps we can do better.